The policies below are applicable to iMediChart owned and operated by eMedLogic, Inc.
eMedLogic, Inc. is the sole owner of the information collected on this site. We will not sell or rent this information to others nor share the information with others in ways different from what is disclosed in this statement. iMediChart.com, collects information from our users at several different points on our website. YOU ACKNOWLEDGE AND AGREE THAT iMediChart IS NOT A HEALTH CARE PROVIDER AND THEREFORE IS NOT SUBJECT TO THE HEALTH INSURANCE PORTABILITY AND ACCOUNTABILITY ACT (HIPAA) WHICH REGULATES HEALTH CARE PROVIDERS. WHILE iMediChart IS NOT REQUIRED TO COMPLY WITH HIPAA, iMediChart HAS USED THE HIPAA REGULATIONS AS A GUIDELINE FOR ITS OWN POLICIES AND PROCEDURES WITH RESPECT TO YOUR PROTECTED HEALTH INFORMATION. In order to use portions of this website, a user must first complete a registration form. During registration a user is required to give their contact information (such as name, address and email address). This information is used to contact the user about the services on our site for which they have expressed interest and to facilitate the use of iMediChart.com. If you register as a patient, then your personally identifiable information is shared with participating docotor's offices as mentioned in this privacy statement. If you are a Doctor, then some of your information is used to display on your home page and wherever it is appropriate on this site. In terms of health care providers, your doctor (and his or her staff) will only be able to access or review your Personal Information, including your medical records, if you give such doctor a unique access code and password. Other health care providers will only have access to such records if you are in an emergency situation and such provider can verify to iMediChart that they are treating you in that emergency situation. If you choose to give a Physician access to your iMediChart account, it is your responsibility to monitor and control such Physician's access. iMediChart IS NOT RESPONSIBLE FOR MONITORING ACCESS TO YOUR ACCOUNT BY INDIVIDUALS YOU GRANT ACCESS TO SUCH ACCOUNT. YOU ACKNOWLEDGE AND AGREE THAT iMediChart SHALL NOT BE LIABLE FOR ANY INFORMATION ADDED TO YOUR iMediChart RECORDS BY YOU OR ANY PHYSICIAN YOU HAVE GRANTED ACCESS NOR SHALL iMediChart BE RESPONSIBLE FOR ANY DISCLOSURES MADE BY YOU OR SUCH PHYSICIAN REGARDING THE INFORMATION IN YOUR ACCOUNT. YOU ACKNOWLEDGE AND AGREE THAT iMediChart IS NOT RESPONSIBLE FOR ANY ADVERSE CONDITION OR EVENT, INCLUDING ANY VIOLATION OF YOUR RIGHTS OF PRIVACY OR MISUSE OR CHANGES TO YOUR MEDICAL INFORMATION, THAT MAY BE CAUSED, IN WHOLE OR IN PART, BY YOUR FAILURE TO SAFEGUARD THE CONFIDENTIALITY OF YOUR ACCESS CODES. YOU ACKNOWLEDGE AND AGREE THAT iMediChart IS NOT A PROVIDER OF MEDICAL OR HEALTH CARE SERVICES AND DOES NOT PRACTICE MEDICINE, OR GIVE MEDICAL ADVICE. YOU UNDERSTAND AND AGREE THAT iMediChart DOES NOT EDIT THE CONTENTS OF YOUR CHART OR RENDER ANY OPINION OR JUDGMENT REGARDING YOUR MEDICAL HEALTH OR PHYSICIANS' CARE. Also, iMediChart may use users personal information to track compliance with our Terms and Conditions, or for content improvement and feedback purposes. 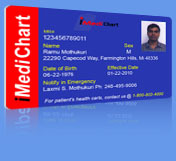 iMediChart also reserves the right to provide member profiles for lawful purposes. When you initially register to become a member on this site, you will be provided with the opportunity to receive promotional offers, via emails, from iMediChart�. While some of these opportunities will only be sent to you if you expressly request them, others may be sent to you unless you elect not to receive them. Accordingly, when you register, please review these offers carefully. Users under 18 years of age are not allowed to participate in iMediChart� offered by iMediChart. We encourage parents and guardians to spend time online with their children and to participate and monitor the interactive activities of their children. For every visitor to our sites, we automatically recognize and collect only the visitor's domain name, but not the e-mail address (unless requested and supplied by the visitor as a registration field entry). All registrants may receive e-mail confirming their Registration, upcoming events, or other forms of e-mail communication from us. If you wish to stop receiving e-mails from iMediChart, you can quickly and easily unsubscribe yourself. Open our e-mail, scroll down to the line that reads: "If you'd prefer not to receive any mails from us in the future, please click below to unsubscribe" and "click". Or alternatively, you can click on: http://www.iMediChart.com/remove.html to un-subscribe. iMediChart may contract with third party vendors to provide services and information to our members. iMediChart uses best efforts to ensure the contract with such vendors only permits the vendor to use the member data collected in the iMediChart data center or handled by them for purposes authorized by the member. All such vendors must comply with the privacy and confidentiality policy of iMediChart and adhere to the requirements of HIPAA for handling Personal Healthcare Information. This web site contains links to other sites. Please be aware that we [eMedLogic, Inc.] are not responsible for the privacy practices of such other sites. We encourage our users to be aware when they leave our site and to read the privacy statements of each and every web site that collects personally identifiable information. This privacy statement applies solely to information collected by this Web site. Since your privacy as a participant in iMediChart.com communities and on the Internet is a priority to us, we have provided this policy statement about our privacy and information dissemination practices .